Glenn Nix was born in 1937 in Lewisburg, Tennessee. He enlisted in the Aviation Cadet Program of the U.S. Air Force on January 20, 1958, and was commissioned a 2d Lt and awarded his pilot wings at Reese AFB, Texas, on April 30, 1959. After completing F-100 Super Sabre Combat Crew Training, Lt Nix served as an F-100 pilot with the 44th Tactical Fighter Squadron at Kadena AB, Okinawa, from April 1960 to June 1963, and during this time he deployed to Southeast Asia in support of the Vietnam War from July to October 1962. His next assignment was as an F-105 Thunderchief pilot with the 336th Tactical Fighter Squadron at Seymour Johnson AFB, North Carolina, from June 1963 to August 1965, and it was during this time that he completed his bachelor's degree during an assignment to the University of Omaha, Nebraska, from January to July 1965. Capt Nix then served as an F-105 pilot with the 67th Tactical Fighter Squadron at Kadena AB from August 1965 to June 1966, flying combat missions in Southeast Asia from August to December 1965, followed by service with the 44th Tactical Fighter Squadron at Kadena and deployed to Southeast Asia from June 1966 until he was forced to eject over North Vietnam and was taken as a Prisoner of War on October 1, 1966. After spending 2,347 days in captivity, Maj Nix was released during Operation Homecoming on March 4, 1973. He was briefly hospitalized to recover from his injuries at Wright Patterson AFB, Ohio, and then served as Special Assistant the Deputy Commander of Operations and Special Assistant to the Commander of the 4th Tactical Fighter Wing at Seymour Johnson AFB from September 1973 to January 1974. 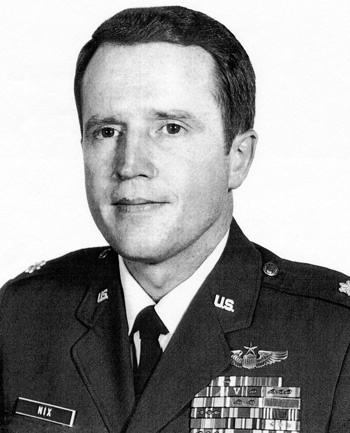 Col Nix served as an F-4 Phantom II pilot and as Operations Officer of the 335th Tactical Fighter Squadron, and then as Chief of Airfield Management with the 4th Combat Support Group at Seymour Johnson AFB from January 1974 to June 1976. His final assignment was at Shaw AFB, South Carolina, where he retired from the Air Force on June 1, 1978. 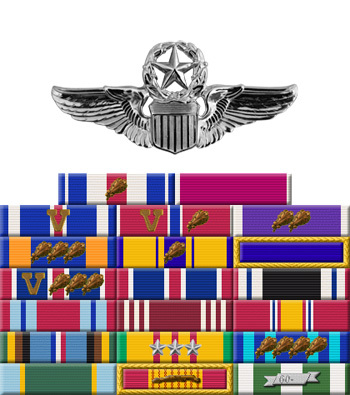 Captain Cowan G. Nix distinguished himself by gallantry in connection with military operations against an opposing armed force near Hanoi, North Vietnam on 5 May 1966. On that date, Captain Nix volunteered to participate in an F-105 strike against a key bridge complex situated on a vital railroad supply line. The hazards of this mission were compounded by multiple antiaircraft gun positions which had exacted a heavy toll of USAF bombers in previous attacks on this same target. Even though visibility was restricted by a dense haze which made navigation hazardous, Captain Nix quickly spotted the target and directed his flight leader to an attack position. Although intense and accurate flak was encountered, Captain Nix was not to be deterred as he aggressively pressed his attack to a dangerously low altitude and dropped his bombs in the center of the bridge, completely demolishing two spans. By his gallantry and devotion to duty, Captain Nix has reflected great credit upon himself and the United States Air Force.